Every week without fail I rearrange my kitchen cabinets. 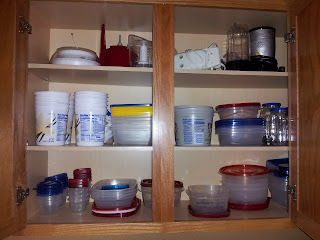 I have organized my Tupperware containers in a certain way, so that they all fit neatly and wonderfully. I have arranged things so that I know where all my items are. That is how I like it. Now you may be wondering why I take the time to rearrange the cabinets every week and the answer is simple; my husband doesn’t put anything back where it goes when he cleans the kitchen. Ok, before you think this blog post is about me bashing my husband it is quite the opposite. Mind you it used to bother me but I have come to accept it as one of his little things. I don’t nag him about it and I don’t complain. I just simply fix it. Like I have said before, we will be married for many years to come. I rather save my nagging and complaining for when it may really matter. Wishing you blessings and messy cabinets in your marriage!